Scorpions and humans often will find themselves living in the same quarters. It just so happens that many of the smaller ecosystems within the larger home environment are the perfect places for scorpions to hide. Damp areas, clutter, and unsealed windows or any other other entry points are all the areas that will attract scorpions. Look for scorpions in the corners, behind the curtains, and in any other areas of the home that are generally left undisturbed. An extra bedroom that is generally unused is a good first place to check for any hiding scorpions. Remember, scorpions can squeeze into very small areas, and like dark and quiet places where they can hide. A wood pile next to a seldom-used fireplace or a closet full of boxes of off-season clothes is likely where home is to scorpions if your home has an infestation of them. Scorpions often enter the home through any electric, phone, or other lines that enter your house. Check to make sure any areas – especially in the kitchens and bathrooms – where pipes enter the home are properly sealed shut. Seals and weatherstripping on doors and windows are also very important. Scorpions can fit through most incredibly thin cracks. Replace weather stripping and check for complete seals around doors and windows of your home. Scorpions can find both shelter and water in damp and dark areas of the home. Laundry rooms have both of these qualities, so be on alert for any scorpions when sorting through clothing and especially damp or wet towels. In fact, if you are wanting to catch a scorpion, leaving a wet towel on the laundry room floor overnight may be the best way to catch a scorpion. Be careful when handling the towel in the morning – use tongs or gloves for safety. Areas that are around the outside of your home may have similar features that can also harbor these pests. Rock piles or rock gardens, wood piles, and areas where hoses attach to the outside of the home are all spots to be checked. 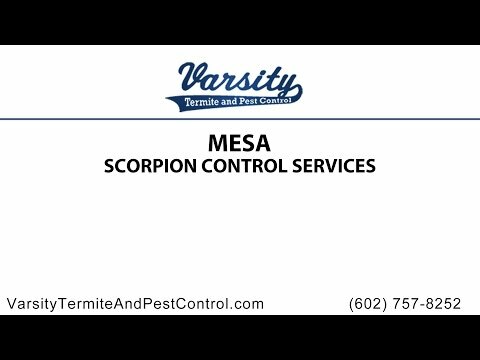 Mesa scorpion control experts Varsity Termite and Pest Control want to help you rid your home of any scorpion infestations you have. If you are looking for a professionalscorpion control in Mesa Arizona, contact Varsity’s fully certified scorpion control exterminators and make an appointment for a free inspection of your home today. Their services have a proven track record of success and carry a full warranty. If you have any questions or concerns about scorpions and want to know more information, please give us a call today! Varsity Termite and Pest Control also does other services for exterminating any pests or termites you might also have too.